What do you do when your relationship is on the rocks? How do you know whether to stay or go? Sometimes the best answer is to look at all possibilities. While past lives are most often accessed by trance sessions and regression or retrieval, this Tarot card spread can also provide surprising clues. Multi-card layouts give lots of information, but what do you do when you need direction fast? Learning to develop three-card spreads is a must for readers. Think about what really draws you to something. Is it the feel? The look? What you see? These things are important when choosing the right Tarot deck. Relocation has many aspects: financial, social, and family dynamics are affected. In this Tarot spread for moving, Corbie Mitleid examines the question. Tarot spreads can help with love, money, and business ventures! 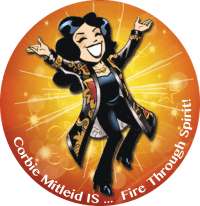 Certified Professional Tarot Reader Corbie Mitleid explains how she counsels entrepreneurs. Circumstances can hand you a turning point, where life has to change. Certified Professional Tarot Reader Corbie Mitleid shares a tarot spread for decision-making. Once the ring is on, planning the perfect wedding is everything! Certified Professional Tarot Reader Corbie Mitleid shares a tarot spread to help the bride.